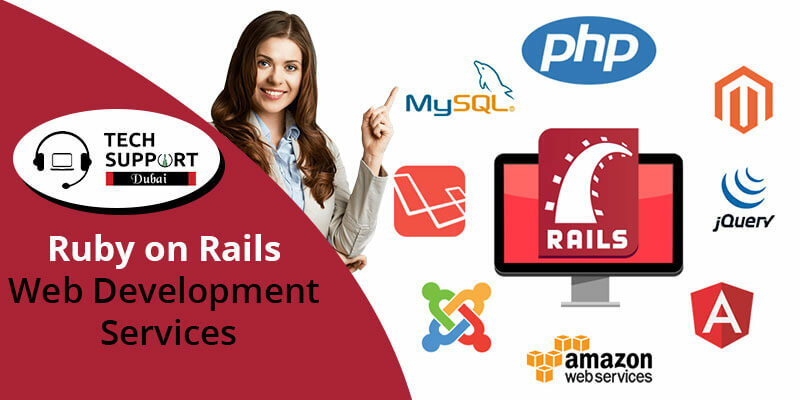 Ruby on Rails is the first open source web application development framework written in Ruby. It was first developed in the year 2004. Being a Model View Controller (MVC) framework, you can easily develop web, mobile and other customized applications with it. As RoR is an oriented programming language and comes with integrated testing tools, it also ensures data safety If you are searching for a trusted service provider who can guide you with the best Ruby on Rails web development services, TechSupportDubai is your ultimate choice. Our experts utilize the dynamism of Ruby in order to implement complex features with minimal coding and higher precision. To build scalable applications, we use Ruby’s extensible toolchain. Our primary focus is to help you build unique industry-specific applications. We will guide you in the best way to develop a unique website by offering efficient RoR services. Because of cost-effectiveness and flexibility, RoR has always been the best choice for the web developers. It reduces wastage of time of the developers, as RoR framework contains ready-made plug-ins and modules. Look at the other additional benefits of the RoR platform. Ensures fast and effective development. If you are looking for affordable RoR development company, TechSupportDubai is the place for you. To fulfill our client’s diverse needs, we have a vast array of Ruby on Rails web development services. We deliver smart and effective solutions for your business by using this fabulous programming language. You can develop intuitive and easy to use the web and mobile applications with our experts. We have years of experience in building cloud-ready Ruby on Rails applications designed to work on Amazon Cloud platform, among others. Therefore, we are successful in delivering robust Ruby on Rails applications. Get elegant and functional solutions. We implement incredible features of RoR framework. We ensure that you enjoy high performance and incredible feature of code optimization with our developers. We provide rapid and custom development services. Place a call at our helpline number by dialing 042053349 and share your worries with our executives. Tech Support Dubai consists of proficient developers who can provide you with Ruby On Rails Web Development Services at a reasonable price. In case you are too busy to talk, drop a mail to us stating your queries and avail quick guidance from our specialists within the next 24 hours. You can even talk to our experts in real-time via our live chat option and avail instant solution. Opt for our trusted services and experience the difference today.